We took Fr. Lehtoranta out to dinner Thursday for his birthday, and were trying to remember when we had such a nice day. It’s been awhile. Candlemas was nice and sunny, but the groundhog surely saw his shadow. We are grateful now for the beauties of Spring. These are Our Lady’s days, of Good Counsel, of Consolation. Tuesday we begin her month. Make May special in your home, too, and under the roof of your soul. It’s always sunny and warm there, on the darkest days, if Jesus and Mary stay. We tend to rush by. Now is the time to stop and pay a visit to your Mother. Fr. 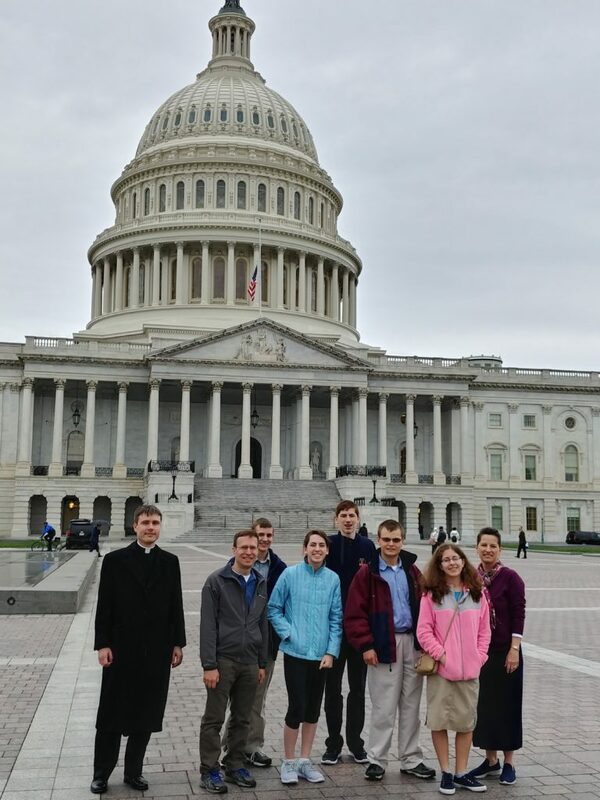 Lehtoranta reports an excellent High School Washington trip, which included a visit to the Senate. The distinguished lady from Minnesota was giving a speech praising “the musician formerly known as Prince.” Your tax dollars at work. The conflation of big government and entertainment would be funny, if it were not so destructive of all that is good, and worse, far worse. We congratulate Sam Arlinghaus who placed second in a state competition for diesel skills. Many of our young people are going for good, stable “blue collar” jobs, and we salute their practicality. But everyone needs the basics of education in order to function. Our school and its fine staff are dedicated to that, and more, as are our devoted home educators. The latter have a help now in a new Skype school being pioneered by the Sisters of St. Thomas Aquinas. That way those who live too far from a real school can get in on a virtual one. A bit like the Mass. God bless the engineers and the technicians who provide us with these highly advanced means to practice our Catholic Faith, and educate our children. Fr. Cekada is heading down to the seminary tomorrow for some good old fashioned teaching. Two of Fr. Nkamuke’s seminarians have been accepted for next year. Father is justly pleased, and remains grateful to all of you who help him feed his seminarians, or take care of his missions. The violence of this world is so often directed against Christ and His Church. Two of “our” mission countries are increasingly dangerous to Catholics, and especially priests; Mexico and Nigeria. Please pray for our safety, for the pastors and the flocks. Fr. McGuire returned to Effingham, Illinois this weekend, stopping in Indianapolis to offer Mass for Mary Black. Holy Face Mission, in south central Illinois, is a growing Mass center. Some of their members will be joining us for Confirmation (it looks to be a big class) on the Vigil of Pentecost. But how proud they were when Fr. McGuire arrived earlier this month with a fine altar from Milwaukee, designed and crafted by St. Hugh’s own Keith Kimpel. It was a sign that they were back together again, after so many years without a Mass. Year ago several priests visited them, including Fr. Fuji, who also preached a mission here in 1992. What a bouquet of feasts Mother Church picks for us this week: Ss. Philip and James, St. Athanasius, Holy Cross, St. Monica, St. Pius V, as well as May Devotions, the Sacred Heart and the Immaculate Heart, All Night Adoration. Take some time to visit the garden, won’t you? P.S. Oh yes, Caravaggio bagged a very big baby bunny last week and deposited it on the kitchen rug when he came in for dinner. It was predispatched, though, which saved me having to chase a rabbit around the house. Caravaggio is a single minded and very enthusiastic eater, so he never looked up from his dinner when I disposed of his gift. Thoughtful. This entry was posted on Saturday, April 28th, 2018 at 1:48 pm	and is filed under Announcements.